The Z1000 gets a once over resulting in styling changes, and a whole whack of electronics headlined by a new "Cornering Management Function". The flagship ZX-10R gets an RR model with a few extras to make it even more track capable. 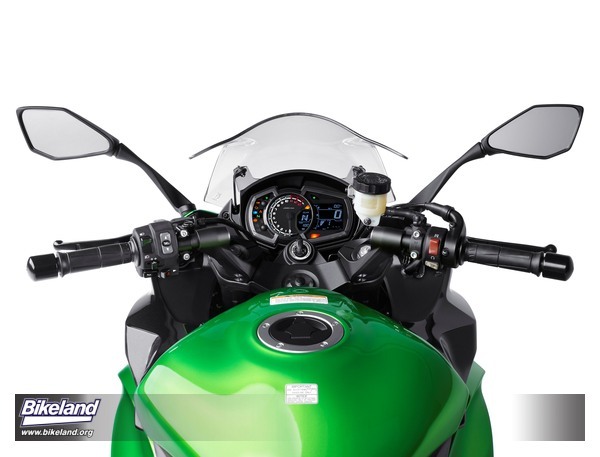 The over the top H2 see several improvements including a cornering electronics like the Z1000. The Ninja 650 gets an overhaul focusing on the chassis. And a whole new bike in the form of the Versys-X 300, which looks rather like a mini KLR. The Kawasaki Ninja® ZX™-10R motorcycle has solidly dominated the FIM Superbike World Championship (WorldSBK) with overall championship wins in 2013, 2015 and 2016. With the unveiling of the all-new Ninja® ZX™-10R supersport motorcycle in 2016, Kawasaki was able to bring riders even closer to the championship-winning race machine found on the WSBK racetracks. Now sharing more engineering advancements from this world-class racing team, Kawasaki is able to trickle down technology to produce and even faster, stronger and more race-focused model—introducing the track-ready 2017 Ninja ZX™-10RR sportbike, getting riders closer. Designed to give racers a competitive edge, the Ninja ZX-10RR has dropped any equipment unnecessary to quick lap times; however, the machine is also suited for street use. The Ninja ZX-10RR meets emissions regulations and featuring proper street lighting, and features an engine tune that’s suitable for street riding. The Ninja ZX-10RR motorcycle doesn’t hide the fact that it’s a purpose-built machine, the purpose, even faster lap times. 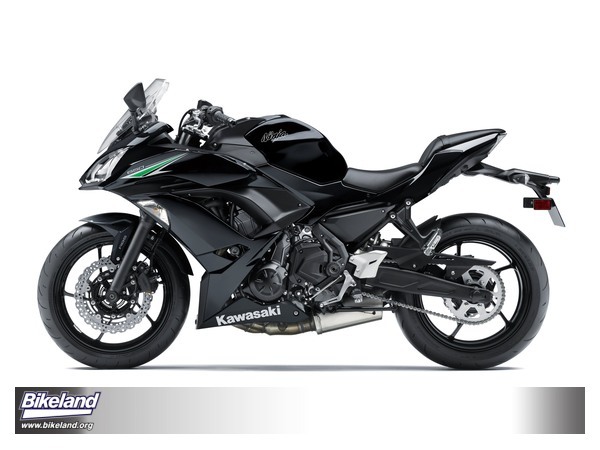 The Ninja ZX-10RR is designed as a single-seat model, keeping with its race-ready priority. Lack of passenger footpeg mounts and a rear seat, along with a lightweight exhaust mount, contribute to weight savings. The single-seat cover, which comes standard, also contributes to the bike’s racy image. The KRT (Kawasaki Racing Team) Winter Test snowflake logo on the cover matches the one on the windscreen. Every model will feature a “RR” logo stamped/engraved into the side cover to further distinguish the Ninja ZX-10RR from the standard model. The ignition key is also adorned with a “RR” logo, adding another special touch. The 2017 Ninja ZX-10RR comes standard with ABS. Using the potent 2016 engine as the starting point, the Ninja ZX-10RR sportbike features added improvements, creating an even stronger performing platform. Changes offer enhanced reliability under racing conditions, the results of feedback from Kawasaki’s racing efforts in the Superbike World Championship. The Ninja ZX-10RR is a true race machine, keeping the performance features of its standard sibling, but with enhanced features true racers will appreciate. For instance, the cylinder head is redesigned to give clearance for race-kit high-lift cams, also the crankcase has high rigidity reinforcements. Another engineering development derived from Kawasaki’s WSBK racing efforts includes DLC (Diamond-Like Carbon) coating on valve tappets, which facilitates mid/long-distance engine break-in, and offers reduced mechanical loss and increased performance for a race-tuned engine (i.e. tuned for high performance). The architecture of the proven 998cc engine retains its 16-valve, DOHC, inline four-cylinder layout and its over-square 76 x 55mm bore and stroke dimensions. The Ninja ZX-10RR motorcycle features a lightweight crankshaft, which allows for quick revving and great throttle response and acceleration. It also has ideal low- and mid-range power output, which is appreciated when exiting a corner on the racetrack or on a favorite stretch of blacktop. Another advantage of the reduced reciprocating mass is better cornering turn-in and easier side-to-side transitions. The cylinder head design incorporates additional clearances for the accessory race-kit larger cams, as well as large coolant passageways like on the standard model, to help provide engine reliability. Long-reach spark plugs are another part of the package, helping to boost ignition efficiency. Electronic throttle valves allow precise control of the intake airflow, contributing to efficient power delivery and seamless integration of the electronic aids such as the Sport-Kawasaki TRaction Control (S-KTRC), the new Kawasaki Launch Control Mode (KLCM) and Kawasaki Engine Brake Control (KEBC). The titanium-alloy exhaust system helps with weight reduction and mass centralization as well as the power to weight ratio by removing significant weight from the bike. 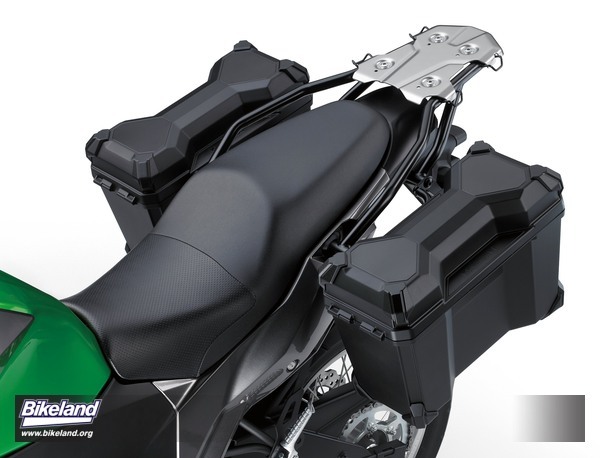 Titanium-alloy headers use a special heat-resistant alloy, which is unique to Kawasaki in a motorcycle application and feature a connector pipe joining headers three and four to help smooth the engine response. The heat handling capacity contributes to durability, while the alloy also allows thinner pipes thickness, reducing weight even more. 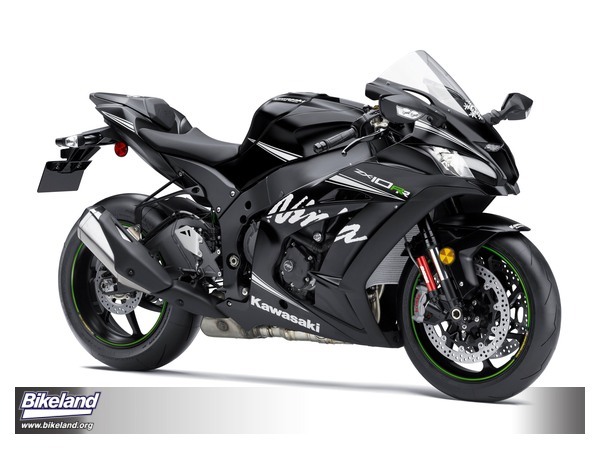 The Ninja ZX-10RR features the same great cassette-type, close-ratio transmission as the Ninja ZX-10R motorcycle. The gear ratios are idealized for circuit riding. Short ratios for second through sixth gear deliver strong corner exit acceleration. The close ratios also give stable downshifts and works with a slipper clutch. Formerly, the Ninja ZX-10R allowed clutchless, auto-blip downshifts only through fitment of race kit parts; now the Ninja ZX-10RR provides that as a standard feature. This allows quick upshifts and downshifts without the need of a clutch, nor does the rider need to match RPMs. This results in a more enjoyable experience and quicker lap times. The 2017 Ninja ZX-10RR motorcycle uses a full complement of electronics that allow the rider to fully explore its performance on the track. 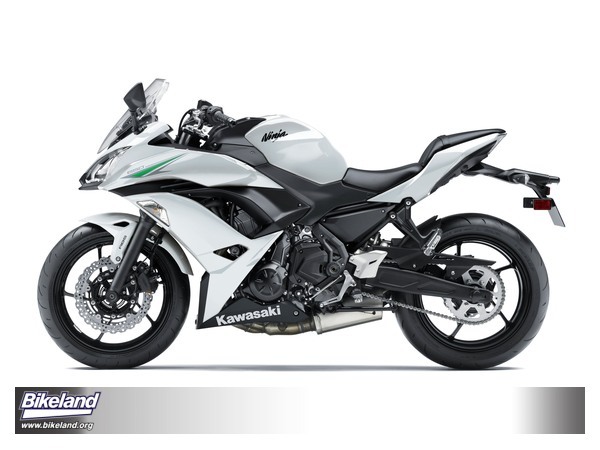 The Kawasaki electronic system uses a proprietary algorithm that optimizes the electronic stability systems. The Kawasaki system uses a Bosch five-axis Inertial Measurement Unit (IMU) with software developed in-house, drawing on the KRT World Superbike experience, making this application unique. For example, it takes the pitch and roll rate data measured by the IMU, and the ECU calculates the yaw rate, resulting in six-axis operation. It provides an additional layer of precision to the already high-level electronics package, giving riders greater confidence on the track by allowing them to explore limits within the parameters controlled by the on-board computer. The IMU input into the ECU works in conjunction with wheel speed, brake pressure, throttle position, engine RPM and throttle opening sensors. This high level of chassis orientation awareness means the ECU can adapt to changes in tires and even road camber. This gives the Kawasaki system an advantage because the S-KTRC, KLCM, Kawasaki Intelligent anti-lock Brake System (KIBS) and Cornering Management Function can respond to real-world conditions in real time, rather than relying solely on pre-set limits like other systems. The Sport-Kawasaki TRaction Control system has five modes of intervention. Modes one and two are designed for an expert racer on the track who prefers some degree of slip control, albeit with minimal intrusion. Mode three is designed for a dry circuit with high-grip tires. Mode four is intended for dry canyon roads or commuting, while mode five is programmed to suit wet circuit or street use. Full power and full slip can be attained by simply switching the TC “OFF’ for those victory lane burnouts! The inclusion of the IMU means that S-KTRC changes from being a purely predictive system to one that also offers feedback. This predictive/feedback system offers even more precise management to help riders push harder on the racetrack by maximizing acceleration. The Kawasaki Intelligent anti-lock Brake System is fitted on the Ninja ZX-10RR sportbike as standard equipment. The multi-sensing brake management system uses high-precision control to modulate brake pressure during sport riding. Using the five-axis IMU and Kawasaki’s original chassis attitude software, the Cornering Management Function helps distribute optimum hydraulic pressure to the calipers based on the motorcycle’s lean/pitch angle. The result is reduction of the motorcycle’s tendency to stand up when applying the brakes in a turn on the track. Instead, the Ninja ZX-10RR ABS motorcycle is better able to follow the rider’s intended line while slowing down for a difficult turn, rather than having the tendency to run wide. Corner Management Function is only available on models with ABS. The Kawasaki Launch Control Mode has three modes, which vary the level of intrusion via the ignition and intake air (throttle valves). Mode one offers less intrusion from the system but requires the rider to operate the clutch and throttle with greater sensitivity. Mode three allows the electronics to do more of the work while the rider simply drops the clutch with the throttle wide open. Mode two gives a setting between the first and third. The Kawasaki Engine Brake Control was first seen on the Ninja H2™R motorcycle to work when the rider snaps the throttle shut. The rider can adjust the level of engine braking or turn the system off completely, via handlebar controls. This feature is intended for circuit use only and contributes to smoother braking and corner entry when used. The available levels are Full, Middle (80%) or Low (60%). These reduce power by the stated amount for street riding and are easily selected via the rocker switch on the left handlebar, allowing riders to select the power delivery to suit their preference. The front section of the main frame has been internally profiled to reduce induction noise, effectively using the interior as a resonator chamber. This has the effect of allowing the exhaust to be liberated, freeing significant horsepower from the engine. Giving the Kawasaki Ninja ZX-10RR motorcycle a distinct advantage over its competition is the Showa Balance Free Fork (BFF). This is the first mass-production motorcycle application for the fork that was jointly developed with Showa in World Superbike competition. The 2017 Ninja ZX-10RR features revised front and rear suspension settings to match the single-seat configuration and new wheels and tires, and ensure smooth weight transfer during both deceleration and acceleration. Other advantages of this system include better traction, improved low-speed comfort and increased frontend feel. When combined with the benefits in braking, frontend feel and comfort, riders will truly appreciate these forks on the racetrack. The Ninja ZX-10RR features seven-spoke, multi-directional forged aluminium wheels, which were jointly developed with Marchesini. These wheels contribute to lighter handling – especially when changing direction. They offer a balance of high rigidity and a significantly reduced moment of inertia (thanks to a design that centralises mass at the hubs). Their machined finish also contributes to their high-quality appearance. 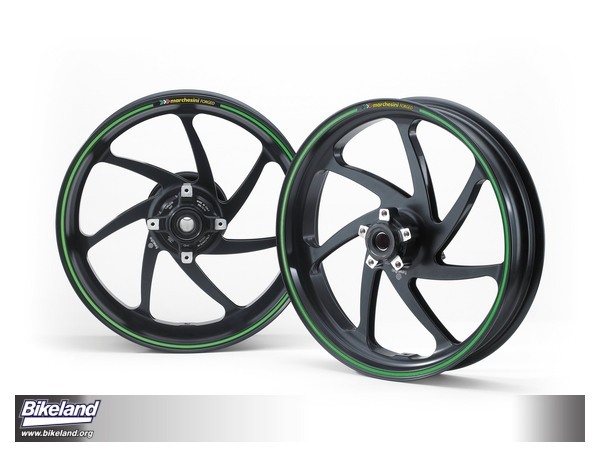 These Marchesini wheels can also be fit on standard Ninja ZX-10R models. Parts necessary for compatibility, such as front brake discs and speed sensor ring, will be made available as Kawasaki Genuine Accessories. The Ninja ZX-10RR is outfitted with premium Pirelli Diablo Supercorsa SP tires, which greatly contribute to quicker lap times with additional grip feeling. As another direct influence of Kawasaki’s World Superbike involvement, the Ninja ZX-10RR motorcycle has been fitted with a Brembo® front braking system. This includes the very high specification M50 aluminium monobloc four-piston front calipers (with 30mm opposed pistons) and Brembo front rotors. The rotors are cross-drilled and have a circumferential groove in the outer edge to aid heat dissipation. The Brembo components offer strong initial bite for circuit use and great feel through the lever. Each part is inspected and adjusted by Brembo to eliminate any ineffective (idle) stroke, providing strong braking force from the initial lever stroke. As a further measure to help provide excellent brake action, race-quality stainless steel braided lines have been fitted front and rear to help ensure direct feel when the brakes are applied. Aiding in the ZX-10RR’s race-driven look is the paint scheme: Kawasaki Racing Team: Winter Test Edition. The Ninja ZX-10RR sportbike will be offered in the same paint scheme that the Kawasaki WorldSBK team uses for their off season test sessions, giving the vehicle a performance look very similar to its racing brother. 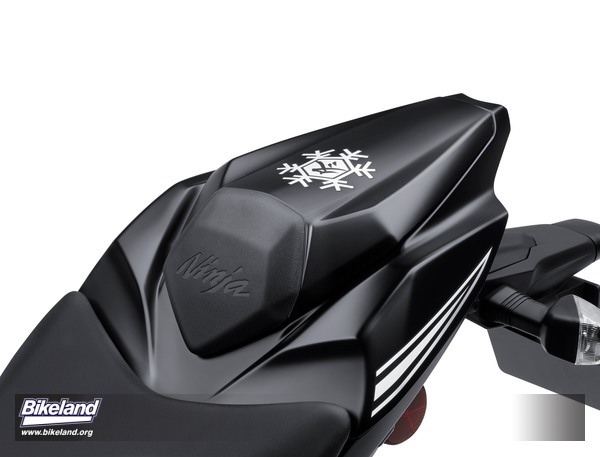 The imposing flat black scheme features minimal white graphics, including a snowflake with the Japanese symbol for “winter” inside. Used for development test sessions only, once sponsorships are secured the livery changes to Kawasaki Racing Team colors and full promotional sponsor logos for race events. The 2017 Kawasaki Ninja ZX-10RR features the same wind tunnel proven body work as its Ninja ZX-10R brother, but with more race-focused touches. The Ninja ZX-10RR includes special RR designations throughout the bike. The rear seat is replaced with an aerodynamic seat cover. The RR designation is stamped on the side engine cover as well as the ignition key, for little added touches of refinement. The main instruments on the Ninja ZX-10RR motorcycle’s LCD portion include the option to change the background color from black to white. There is also an IMU indicator, as well as Launch Control, Quick Shift and Engine Braking activation, plus gear position indicator, Power Modes, S-KTRC modes (and Off), low fuel level, Economic Riding Indicator, intake air temperature, odometer, dual trip meters, average fuel consumption, instant fuel consumption and a host of indicator lamps. To select these functions, a rocker switch is located on the left handlebar that incorporates a “select” button to allow the rider to scroll through the functions. A wide variety of Kawasaki Genuine Accessories will be available for purchase through Kawasaki’s nationwide dealership network. These include Kawasaki Genuine Accessories Race Kit parts, to get your Kawasaki Ninja ZX-10RR even closer. The roar of a pack of superbikes echoes through the rolling hills of Northern California. The world famous Laguna Seca Race Track is alive with another race weekend. The lead group climbs the backstretch headed for the corkscrew. Atop the adjacent hill is a lone sportbike parked overlooking, watching as the laps tick away with lightening speed. The checkered flag waves signaling the end of the race, but the beginning of your adventure. The kickstand snaps up, as you roll onto a two-lane twisty road. You head west, towards the coast. You’re many miles from home, but you still decide to take the long way back. You’re a racer at heart, but you’re not on the track—at least not today—instead, you’re riding many miles to watch the race up close. Now, it’s time for you to have your fun. Introducing the 2017 Ninja® 1000 ABS, infused with Ninja sportbike spirit, speed-minded technology and engineering, but with the comfort of a touring motorcycle. 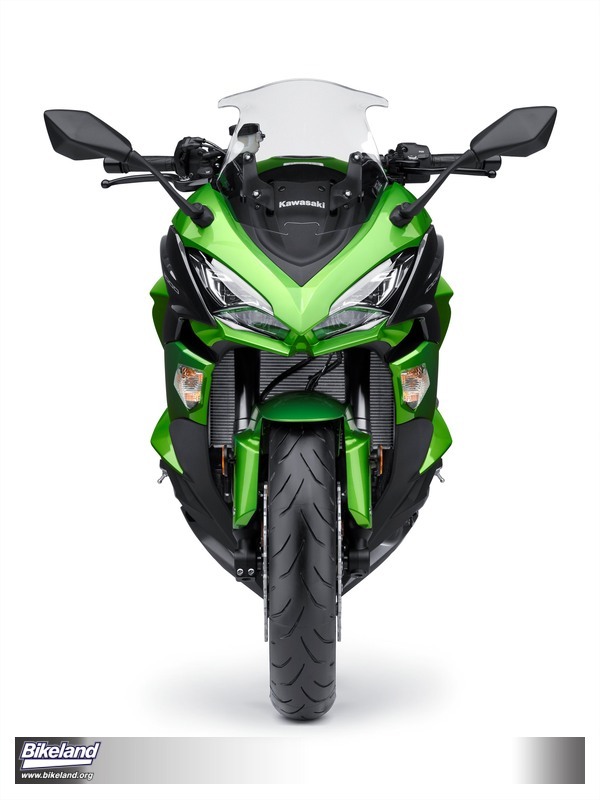 Kawasaki’s flagship, open-class sport touring bike with power and comfort, the Ninja 1000 ABS returns for 2017 with added electronics, normally reserved for race models. 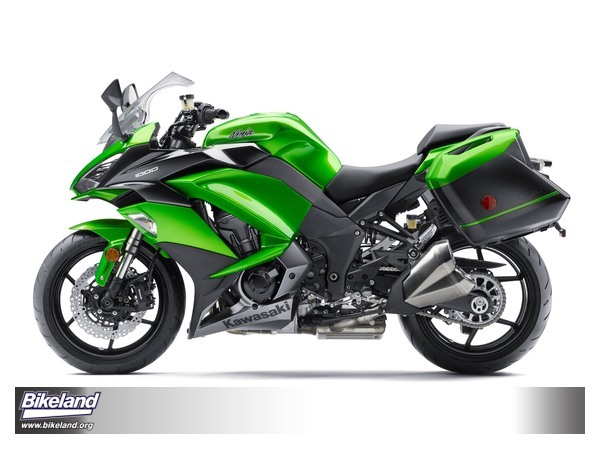 Built for riders wanting sporty handling and smooth, powerful acceleration, the Ninja 1000 ABS has all of that, but in a relaxed, comfortable riding position—creating a motorcycle with liter-bike performance, but a level of comfort and versatility that allows the miles to roll on with ease. Now, with the added electronics, the 2017 Ninja 1000 ABS will give riders increased confidence on their next ride. New for 2017 are wider fairings, a new double-bubble windscreen, 5-way adjustable clutch lever and seat, all aiding in increased rider comfort, making the 2017 Ninja 1000 even more enjoyable. Hard, KQR™ color-matched saddle bags may be selected from among a variety of Kawasaki Genuine Accessories, further enhancing the touring comfort of the Ninja 1000 ABS. Utilizing technology previously reserved for the Ninja® ZX™-10R sportbike, the 2017 Ninja 1000 ABS motorcycle features a 6-axis Bosch Inertial Measurement Unit (IMU) that includes electronic rider aids such as: Kawasaki Cornering Management Function, Kawasaki TRaction Control (KTRC) , and Kawasaki Intelligent anti-lock Brake System (KIBS). The system uses minimal hardware but complex Kawasaki proprietary software. The strength of Kawasaki’s cutting-edge electronics has always been the highly sophisticated programming that gives the ECU an accurate real-time picture of what the chassis is doing. Kawasaki’s proprietary dynamic modeling program makes skillful use of its formula as it examines changes in multiple parameters, enabling it to take into account changing road and tire conditions. The new Bosch IMU enables inertia along five DOF (degrees of freedom) to be monitored: acceleration along longitudinal, transverse and vertical axes, plus roll rate and pitch rate. While the sixth axis, yaw rate, is calculated by the ECU using Kawasaki original software. Bosch’s latest IMU is compact and very lightweight, weighing only 40 g.
Using the latest evolution of this advanced modeling software, KCMF monitors engine and chassis parameters throughout the corner – from entry, through the apex, to corner exit – modulating brake force and engine power to facilitate smooth transition from acceleration to braking and back again, and to assist riders in tracing their intended line through the corner. Three modes cover a wide range of riding conditions, offering either enhanced sport riding performance or the peace of mind to negotiate slippery surfaces with confidence. Modes 1 and 2 prioritize maximum forward acceleration, while Mode 3 provides rider reassurance by facilitating smooth riding on slippery surfaces. Riders may also elect to turn the system off. In Modes 1 and 2, highly sophisticated programming allows a degree of slip – a certain amount of slip is required to maximize acceleration. The ideal slip ratio varies according to conditions. The system looks at a number of parameters to get an accurate real-time picture of what is going on: front and rear wheel speed (slippage) and various engine, machine and rider input parameters are monitored. The IMU-enhanced feedback allows even more precise management than on the previous model. KIBS is a multi-sensing system, using the input from numerous sources, to provide the best braking possible. In addition to front and rear wheel speed sensors (standard for any ABS system), KIBS also monitors front caliper hydraulic pressure and various information from the engine ECU (throttle position, engine speed, clutch actuation and gear position). High-precision brake pressure control enables the system to avoid reduced brake performance due to excessive pressure drops, allows lever feel to be maintained when KIBS is active, and helps ABS pulses feel smoother (not heavy). High-precision brake pressure control also offers a number of sport riding benefits: less rear lift under hard braking, minimal kickback during operation and accounting for back-torque. With the addition of the new KIBS systems comes improved rear brake pad material and optimized spring. The relatively upright position—compared to supersport models—offers both control and comfort for riders. Separate, raised clip-ons are mounted on top of the forks, for relaxed arm position, while maintaining a sporty and comfortable riding position. A new 5-way adjustable clutch lever can be set to suit the size of the rider’s hands, aiding in rider comfort. Mirrors are positioned 20mm farther outward and have a greater range of movement, offering easier adjustability. Both rider and passenger seats deliver increased comfort. The redesigned rider seat has a wider seat area, offering greater support, and enabling longer stretches without having to stop due to discomfort. The passenger seat is longer with thicker urethane padding and a design that swells at the front, resulting in a larger seat area that keeps passengers from sliding forward. Dampers on the underside of the seat also help reduce vibration. Ergonomically sculpted passenger grips are easy to hold and naturally positioned, contributing to even more passenger comfort. The fairing design also covers part of the frame, contributing to a good ergonomic fit and helping to protect the rider from engine heat for added comfort. 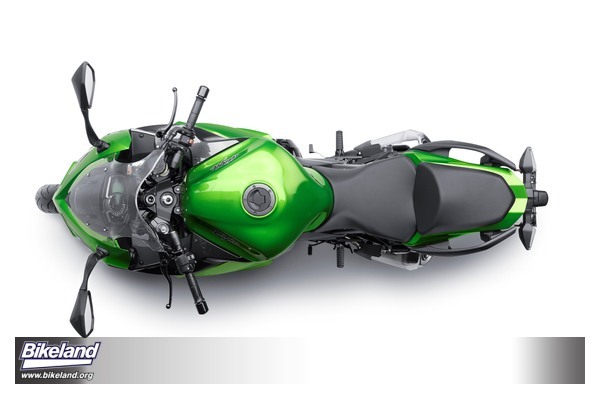 Supersport-style full-fairing bodywork gives the Ninja 1000 ABS motorcycle a distinct, head-turning look. The sleek styling also offers a good measure of wind protection, aiding to reduce rider fatigue. Front cowl design is much sharper, giving the 2017 Ninja 1000 ABS a much sportier appearance and greatly increasing its Ninja family resemblance. 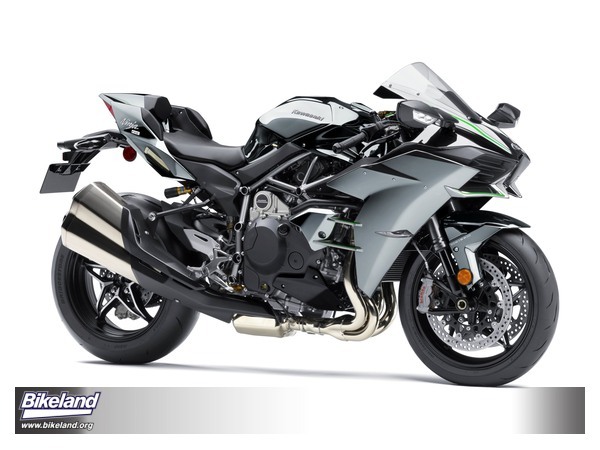 Chin spoilers similar to those on the Ninja H2™ and Ninja ZX-10R motorcycles strengthen the resemblance. Turn signals are built into to the fairings to aid in the slim profile and sporty look. Supersport-style front fender contributes to both aerodynamics and racy looks. Powerful 1,043cm3 liquid-cooled, 4-stroke in-line four-cylinder engine pulls strongly from all rpm. Adding to rider exhilaration, the engine delivers superb engine response, a strong mid-range hit and an intoxicating intake howl. Revised engine settings offer even smoother power delivery, facilitating control and contributing to rider comfort and confidence. Downdraft throttle bodies allow for the shortest path to the engine, helping for ideal low-mid range power. The throttle bodies are oval sub-throttles allowing for a slim profile of the engine as well. 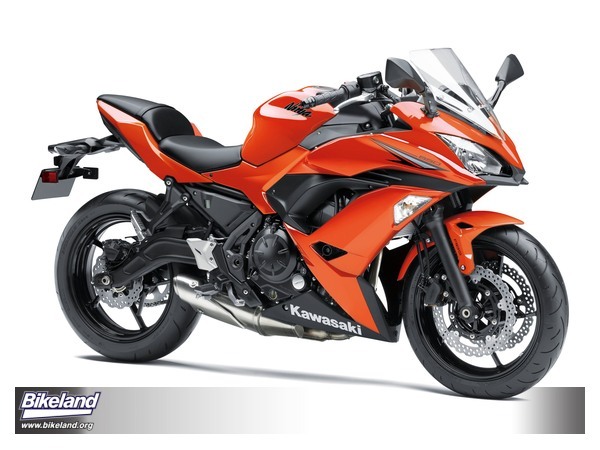 The Ninja 1000 ABS features many enhancements that allow for a smoother engine feeling and less vibration to the rider. One major feature is the secondary balancer on the engine crankshaft, which eliminates excessive vibration. Thanks to a rigid, lightweight aluminum frame and compact engine design, the weight is not only low and centered inside the motorcycle, but the overall profile is also slim. This centralization allows for sharp handling, neutral steering and a light turn-in. Lightweight and highly rigid, the frame uses the engine as a stressed member. The frame is a 5-piece cast aluminum construction, consisting of steering stem, left and right main frames, and two cross pieces. The front part of the rear frame is an example of form and function combined, allowing the side covers to be eliminated. This also allows the width under the seat to be narrower, offering riders a shorter reach to the ground. Up front you’ll find 41mm inverted front forks with stepless compression and rebound damping and spring preload adjustability. Settings offer both sporty performance (contributing to light handling on the street and in the hills) and comfort. Rear suspension positions the shock unit and linkage above the swingarm, allowing for greater mass centralization. The rear shock features rebound and preload adjustability, with a remote preload adjuster facilitating setting changes to suit tandem riding, luggage or rider preference. This is ideal for quick, on-the-go adjustability when traveling. An all-new instrument panel layout features a large analogue tachometer flanked by warning lamps on one side, and a gear position indicator and multi-function LCD screen on the other. The LCD screen features a negative-lit display, adding to the instrument cluster’s sporty, modern appearance. Gear position indicator increases shifting precision and confidence, while also lending to the Ninja 1000 ABS’s sporty image. Complementing the gear indicator is a new shift light, the tachometer’s needle changes color (from white to pink to red) to indicate the rider-selectable shift-up timing. During normal operation the shift indicator lamp is off, and the tachometer needle is white. When engine speed is within 500 rpm of the selected shift-up timing, the shift indicator lamp flashes, and the tachometer needle turns pink. When the pre-chosen rpm is reached, the shift indicator lamp flashes rapidly, and the tachometer needle turns red. Riders can set the shift-up timing between 5,000 and 11,000 rpm in 250 rpm increments. The shift indicator function can also be turned off completely. In addition to the digital speedometer and gear position indicator, display functions include: odometer, dual trip meters, remaining fuel range, current and average fuel consumption, external temperature (new for 2017), coolant temperature, clock and the Economical Riding Indicator. The 2017 Ninja 1000 ABS motorcycle will be in dealerships starting March, 2017. Check with your local dealership for availability. A lone sportbike is heard gliding through the turns of a two-lane mountain road. A casual Sunday, with the sun falling behind the peaks, and the light fading. Through one corner and onto the next, each mile bringing a new adventure. Carving out your own line, you daydream of the racetrack. The race may be on TV, but at home your couch is empty. Instead, you replay the race in your head as you roll into the next corner and out to a long straight. You blast past the local biker-hangout café. The parking lot is full, riders stand and talk in their full-race leathers. But you have no time for standing. - NEW Sportbike cowling, headlight and design elements. Kawasaki’s 650cc parallel twin has been a winner on the race track in the AMA PRO Flat Track series, and is also a proven street engine. Designed with a steady and smooth torque curve and progressive clutch, the power plant for the Ninja 650 is great for riders of all experience levels, making for a fun and easy ride for riders gaining experience and for those with thousands of miles under their belts. The engine of the 2017 Ninja 650 features a new, slimmer intake and throttle body ports which allow for finer atomization of fuel and improved engine air-flow. These changes result in improved, smoother power down-low. Camshafts also now feature reduced overlap and less duration. The exhaust pipe length has also been shortened. These changes result in an engine that’s smooth and progressive with better low-to-mid range power. The engine retains its smooth off-throttle power delivery, with a steady climb to max output. The torque curve is now smoother and more consistent to redline. Along with more performance and better emissions the 650cc engine also has improved fuel consumption. A new assist and slipper clutch allows for a lighter clutch pull and reduces rear-wheel hop during downshifting. This is ideal for new riders learning and for those wanting a carefree ride. An new high-tensile steel, trellis frame uses the engine as a stress-member, bringing engineering development from performance bikes like the Ninja H2™ to a lightweight, entry-level platform. Minimized bends cut down on stress-points in the frame and result in a lighter overall weight by nearly 40 pounds. The rear section of the frame is twin-tube, for added rigidity and improved carrying capacity. The new gull-arm swingarm provides space for the central mounted exhaust, while creating a strong mount from the frame pivot point to axle. The new horizontal back-link suspension design features a linkage with progressive ratio, creating better suspension action and improves the rider’s feel of the road. The Ninja 650 tows the line between racy sportbike and comfortable commuter. New top-mount clip-on handlebars further showcase its sportbike heritage, but the slightly higher positioning, combined with the new, lower seat height, allows the rider to sit upright with relaxed hand positioning. The grips are mounted slightly forward, to aid in the slightly aggressive stance, making the Ninja 650 a great motorcycle on the weekend canyon ride or on the Monday commute. This year the Ninja 650 seat height has been lowered 15mm, for a more stable foot placement when stopped and lower center of gravity. This year features a newly designed adjustable windscreen for added wind protection. The setting sun and crashing waves paint a picture of bliss as you sit roadside enjoying the view. Your motorcycle is the key to adventure and adventure knows no bounds. It has no limitations or deadline, no cubical or conference calls. Where you’re going now, well that’s yet to be determined. Just man and machine, enjoying the limitless world. The Kawasaki Versys® motorcycle family is designed for adventure-style touring. Introducing the new, nimble, easy to maneuver and low-investment, the 2017 Kawasaki Versys-X 300 ABS. Versatile, capable and comfortable, the Versys-X 300 motorcycle is the new entry-level model in the award-winning lineup and Kawasaki is excited to encourage a new generation of motorcyclists set on making their own adventures. At 296cc, the Versys-X 300 is the smallest-displacement model in the adventure-touring category. It offers the best comfort and convenience of any sub-300cc model, as you’d expect from a bike designed to be the ideal travel partner. Not only is it light and nimble, but with the narrow chassis and low seat height, it’s an ideal motorcycle for new riders—The Versys-X 300 offers easy access to motorcycle adventuring. 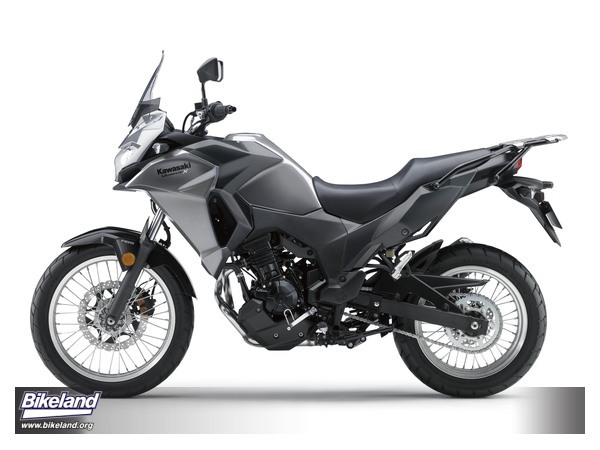 With a relaxed upright seating position, front fairing and windscreen, sporty and nimble handling, it’s also an ideal motorcycle for a variety of riding conditions. From the rough paved roads, to the morning commute, the Versys-X 300 is an easy-to-ride motorcycle that makes adventure-style motorcycling more accessible than ever before. offers convenience and comfort as the first touring capable machine in its displacement category. The Versys-X 300 is categorized as a “Multi Purpose Adventure Touring on Road” bike and is the entry model to the Versys family. The Versys-X 300, while the youngest in the family of Versys motorcycles, sets itself apart from the rest in many ways. It’s not only a lightweight, capable machine, but it also features a rough-road adventure style and rugged look. The front cowling is long and tall with a chin spoiler in the bottom section. This design is meant to be equal parts functional and stylish, aiding in the adventure look, while maintaining ample wind protection. Air ducts positioned under headlights also reduce hot air buildup inside the cowl, a simple engineering design that increases comfort and helps reduce riding temperature. Large side openings in the side panels offer an efficient place for hot air to be released from the radiator. The 4.5-gallon fuel tank contributes to the adventure-style image and function while maintaining a slim design. 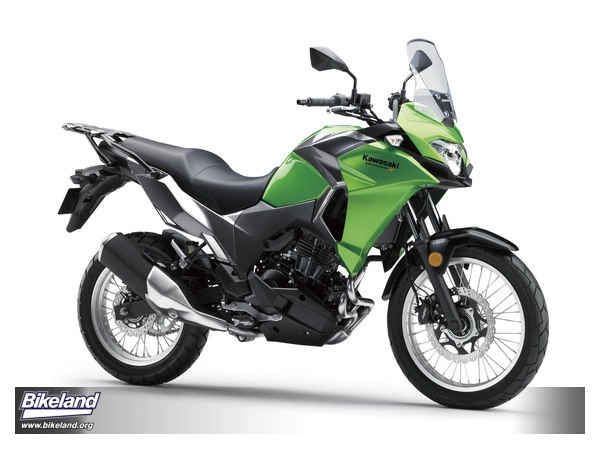 The Versys-X 300 features a 19-inch front aluminum rim and a 17-inch rear aluminum rim, both with steel spokes. The large two-up seat features excellent comfort and load-bearing qualities with a seat cover carefully stitched from multiple pieces, creating a premium feel on par with more expensive models. It wouldn’t be a Versys without a rear carrier with easy to use grips and strap hooks for adding luggage. A wide variety of Kawasaki Genuine Accessories will be offered to take the Versys-X 300 even further, and to help riders create a personalized motorcycle that meets their needs. The Versys-X 300 motorcycle utilizes the proven performance of its liquid-cooled 296cc parallel-twin engine, which is tuned to deliver strong low- and mid-range torque for crisp throttle response, as well as excellent power on the open road. Much of its prowess can be attributed to its advanced digital fuel injection, which helps manage cold starting while providing excellent throttle response. The Versys-X 300 features a unique slim exhaust design that keeps the header pipes close to the engine, for added protection against the elements. The exhaust piping is also unique to the Versys-X 300 motorcycle, helping to produce low and mid-range torque characteristics best suited for an adventure-style touring model. It also means easy-to-manage power delivery and added ground clearance. Further aiding in the adventure styling and capability is a right-side mounted muffler that helps keep heat away from the passenger. The six-speed sequential transmission features a positive neutral finder, making it a cinch to select neutral when stopped. A premium FCC clutch with assist and slipper functions reduces lever effort. The Versys-X 300 motorcycle features revised friction area for the assist and slipper clutch spring rate and lever ratio. This expands clutch control range, and facilitates moving off from a start, resulting in a clutch with a light pull and easy feel. The Versys-X 300 features gear ratios ideal for adventure-style riding with a shorter final reduction ratio. This produces optimized balance between fuel consumption and power feeling and improved low-mid range feel and response. The engine is used as a stress member of the frame further increasing the strength while keeping it low weight. Out back is a long-stroke, bottom-linkage Uni-Trak® suspension with gas-charged mono-shock and adjustable preload. This helps ensure handling stability and allows riders to touch down with ease, increasing comfort. The rear shock mount and rear section of the frame were built with increased amounts of bracketing and surface area, in order to increase the rigidity. This allows for more durability and increased suspension action. Up front you’ll find long-travel 41mm Showa forks. The forks aid in great front-end feel and provide comfort on various roads. A major bonus for the Versys-X 300 is its wide steering angle which assists in low speed maneuverability and overall usability. When designing the Versys-X 300, the front suspension was an important part in terms of form and function, with great care taken into making the front suspension fit the adventure look from handlebar to axle. The 2017 Kawasaki Versys-X 300 motorcycle is available with and without ABS.